GraceLinBlog: #7 on the NY Times! 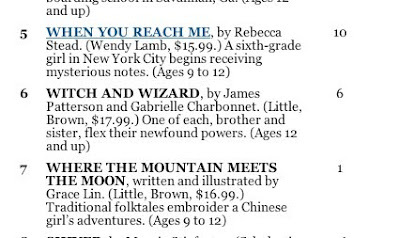 Where the Mountain Meets the Moon is #7 on the NY Times Children Bestseller list!! WOW!!! I never thought I'd see the day when a book of mine would be on that, truly. This just goes to show the power of librarians!! They are more powerful than Al Roker! The only small (very, very small!) downer is that the children's list is only printed when they have children's reviews...which is once a month. I have to hope that the book stays on there for a month if I want to get a real newspaper printed copy of the list (which I very much want because I don't know if this will ever happen again!). Now, I am really stocking up on the jade bracelets.